– Safe custody of all records of births and deaths. Requirements or fees specific to children who are eligible for citizenship but were born outside the country Yes, Kenyan children born outside the country are entitled to registration upon application; the registration is free, but the birth certificate requires a fee. Process for establishing vital statistics on births Data from the 109 offices across the country are submitted monthly to the Department of Civil Registration Services headquarters, which is responsible for monthly compilation of statistics. While the data are compiled monthly by the Department itself, a team of stakeholders including the National Statistical Office come together annually to prepare an Annual Vital Statistics Report. The National Statistical Office (Kenya National Bureau of Statistics) is responsible for dissemination of official statistics. Is an official marriage certificate issued as a result of marriage registration? Yes, upon the celebration of a marriage, the person officiating the marriage should issue a copy of the marriage certificate to the parties, retain a copy, and send a copy to the registrar (Marriage Act, section 21). Time allowed for registration The person officiating a marriage shall forward a copy of the marriage certificate to the registrar within 14 days (Marriage Act, section 53). Can the fee be increased or waived? Yes, depending on where the marriage is celebrated, e.g., a separate venue other than the registrar office or a church, a special fee might be implemented to license the venue. Legal framework for marriage registration There is no provision under the Marriage Act concerning the compilation of statistics. 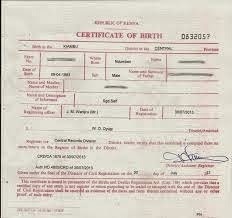 Is an official death certificate issued as a result of death registration? A notification of death (death register) is signed by a medical practitioner or community registration agent (assistant chief) who then forwards the notification to the registrar. A death certificate is issued upon application by an applicant; the certificate is then prepared from an existing register. Process for establishing vital statistics on deaths Data from the 109 offices across the country are submitted monthly to the Department of Civil Registration Services headquarters, which is responsible for monthly compilation of statistics.